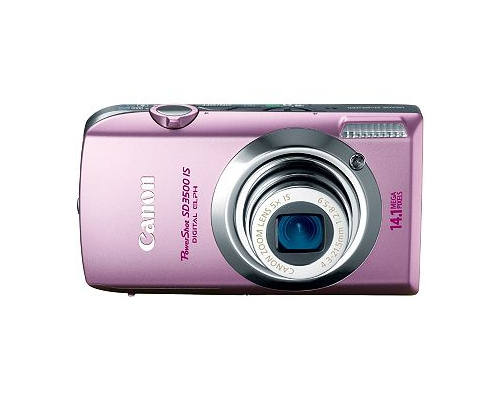 The Canon PowerShot SD3500 IS is a consumer point and shoot digicam with a touchscreen LCD in a small, sturdy package and features designed to take advantage of this functionality. The camera measures 3.91" by 2.20" by .87" and weighs 5.64 ounces with the batteries and memory card included, making it fairly consistent with Canon's other point and shoot digicams. It should fit in a pocket, removed from a case, without much trouble. The camera has a resolution of 14.1 effective Megapixels captured via a 1/2.3" type Charge Coupled Device. Its total pixel rating is approximately 14.5 Megapixels. The camera has a focal length of between 4.3 (W) and 21.5 (T) mm, equivalent to between 24 and 120 mm in a 35mm camera. It has a 4x digital zoom and a focusing range of between 2" and infinity (W) and 3' and infinity (T). Its Macro rating is between 2" and 1.6' and infinity (W). It also includes a TTL Autofocus system. The camera includes a fairly large 3.5" LCD with Touch Panel Technology, allowing for users to configure playback, zoom, and focus, among other things. It offers approximately 461000 pixels and 100% coverage. The camera's maximum aperture is between f/2.8 (W) and f/5.9 (T) and offers shutter speeds between 1/3000 and 1 seconds, as well as a total shutter speed range of between 1/3000 and 15 seconds. The Long Shutter operates at speeds of 1, 1.3, 1.6, 2, 2.5, 3.2, 4, 5, 6, 8, 10, 13, and 15 seconds, with noise redution available between 1.3 and 1.5 seconds. The camera's sensitivity is set automatically or can be adjusted to settings equivalent to ISO 80, 100, 200, 400, 800, or 1600. It includes Evaluative, Center-Weighted average, and Spot-based light metering, as well as exposure control based on Program AE, i-Contrast, and AE Lock settings and exposure compensation set between -2 and +2 stops in 1/3-stop increments. White Balance Control settings are automatic, but can also be set to Daylight, Cloudy, Tungsten, Fluorescent, Fluorescent H, or Custom. The built-in flash can be set automatically, but also can be set to Red-eye Reduction, Auto Red-eye Correction, Flash On, Flash Off, FE lock, and Slow Synchro, as well as a flash range between 1.6 and 11' (W) and 3' to 6.6' (T). Its recycling time is 12 seconds or less, and it does not offer flash exposure compensation. The camera features shooting modes Auto, P, Portrait, Night Snapshot, Kids & Pets, Indoor, Smart Shutter, Low Light, Color Accent, Color Swap, Fisheye Effect, Miniature Effect, Creative Light Effect, Beach, Foliage, Snow, Fireworks, Long Shutter, and Movie. It also includes Photo Effects such as My Colors Off, Vivid, Neutral, Sepia, Black & White, Lighter Skin, Darker Skin, Vivid Blue, Vivid Green, Vivid Red, and customization of contrast, sharpness saturation, and control of red, green, blue, and sin tones. The self-timer functions on an approximate 10-second delay and can be set between 0 to 10 seconds in 1-second increments, as well as 1-10 shots at a time. It can shoot up to .7 shots per second (2.7 in low light), and does not offer wireless control. The camera includes a USB port to interface with computers and PictBridge-compatible printers. It stores media on SD, SDHC, and SDXC memory cards, as well as MultiMediaCard, MMCplus Card, and HC MMCplus Card media. It captures JPEG images with Exif 2.2 compression and captures movies in MOV, using H.264 for compression of video and Linear PCM monaural audio. The camera outputs video in NTSC and PAL. The camera can capture images at resolutions between 640 by 480 and 4320 by 3240 for still images and between 320 by 240 and 1280 by 720 for video, making it possible to record in HD. However, doing so will quickly fill a memory card; 4GB media can capture 10 minutes of HD video at 30 frames per second. A rechargeable lithium-ion battery powers the camera, which can be charged externally via an AC adapter kit. The battery offers approximately 5 hours of playback or approximately 220 shots with the LCD screen on. Some users report slow shooting performance and a fragile door holding in the camera's battery and memory card. Because this is a point and shoot digicam, few accessories are available. Canon offers a metal neckstrap, battery pack, and leather case, as well as an AC adapter and battery charger. USB, AV, and mini-HDMI cables are available, as is a high-powered flash rated at a maximum distance of 23'.